Joseph Kevin Keegan, OBE (born 14 February 1951) is an English former football player and manager. A forward, he played for several clubs including, Newcastle United, Southampton, Liverpool and Hamburger SV. He went on to manage Newcastle United, Fulham and Manchester City, winning promotion as champions in his first full season at all three clubs, and also the England national team. As a player in the 1970s and 1980s, he has been described as "arguably the first superstar English player to attract the modern media spotlight". He began his playing career at Scunthorpe United in 1968, before moving to Liverpool in 1971. At Liverpool, Keegan won three First Division titles, the UEFA Cup twice, the FA Cup and the European Cup. He also gained his first England cap in 1972, and moved to West German club Hamburger SV in the summer of 1977. At Hamburg, he was named European Footballer of the Year in 1978 and 1979, won the Bundesliga title in 1978–79, and reached the European Cup final in 1980. Keegan moved to Southampton that summer, and spent two seasons at the club before a transfer to Newcastle United in the English second division in 1982. He helped Newcastle to promotion in his second season, and retired from football in 1984, having been capped 63 times for England, scoring 21 goals. He moved into management at Newcastle in 1992, winning promotion as First Division champions. Newcastle then finished second in the Premier League in 1995–96, after leading for most of the season. After a spell at Fulham, he took charge of the England team in February 1999, but resigned in October 2000, following a 1–0 loss against Germany in qualification for the 2002 FIFA World Cup. He then became manager of Manchester City in 2001 and spent four years at the club before resigning in 2005. He had been out of football for almost three years when he returned to Newcastle United for a second spell as manager in January 2008. This spell lasted only eight months, however, as Keegan resigned on 4 September 2008 following speculation regarding a dispute with the club's directors. His ancestors arrived in Newcastle from Ireland. In 1909, his grandfather Frank, an inspector, heroically saved lives in the West Stanley Pit disaster. His father Joe and uncle Frank were Newcastle United fans. His father was a man who liked a bet and a pint of beer, and his favourite Newcastle footballers were Hughie Gallacher and Jackie Milburn. His father Joe though, never saw Keegan play for Newcastle. His father Joe moved to Armthorpe in Doncaster to work in a colliery. Keegan was born in Armthorpe in Doncaster. He was born at his auntie Nellie’s house at 32 Elm place, Armthorpe. His aunt's house was chosen as she had electricity that made it safer for childbirth. Keegan attended his local school, St. Peter's High School, in nearby Cantley. Keegan was given his first football by his uncle Frank. Keegan would play football at Hyde Park using his baby brother, Michael in his pushchair as a goal post. As a schoolboy, Keegan had a trial for Coventry City, under manager Jimmy Hill. Despite being one of two players kept on for an extra six-week period, the club did not offer Keegan a contract, though they did offer apprenticeship terms to the right-back Brian Joy who also went onto have a 15 year career in football. Keegan also had a trial with his local football club Doncaster Rovers. The trial was arranged by his father but when Keegan arrived for a trial he found out he had been given the wrong information and the trial was earlier in the day and at a different place. Keegan was in to sports, such as cross country running, rugby, football, and even captaining his schools poor cricket team. He also boxed at his local boxing club ran by the former British Heavyweight champion boxer Bruce Woodcock. At age 15 Keegan, with two friends, ran a 50 mile run from Nottingham to Doncaster. After completing this run Keegan claimed he would never hit a psychological brick wall again with regards to running. In his autobiography Keegan claimed this run prepared him physically and psychologically for any running he had to do in any future pre-season training or football matches. Keegan, distracted by sport, would leave school with 'O'Levels in History and Art. At the age of 15 Keegan started work at Pegler Brass Works as an office clerk; though Keegan admitted he was more of a tea boy and a messenger than an office clerk. Whilst working at Pegler, Keegan continued playing Saturday afternoon football for his local youth club Enfield House and playing Sunday morning football for the Lonsdale Hotel. It was whilst he was at Pegler that a colleague of Keegan, named Harry Holland, asked Keegan if he fancied a go at playing for the Peglers Works reserves on a Saturday morning; down beaten Keegan accepted the offer to play for the reserve team. His chance at professional football did not come at Pegler Works reserves, but came when he was playing Sunday morning league football. When Keegan was playing for the Lonsdale Hotel in a match against Woodfield Social in 1966, Keegan was marked by an older player, in his mid 30’s, called Bob Nellis. After playing against Keegan, Nellis became impressed by the ability of Keegan. Nellis had some contacts at Scunthorpe United, and in turn offered Keegan a trial at fourth division Scunthorpe United - one of just two professional sides in the division. This trial would lead to the Scunthorpe manager Ron Ashman giving Keegan his first contract in professional football. Scunthorpe United could not afford a set of football nets and trained on a rugby pitch at Quibell Park. They also, risking injury, had five-a-side training sessions on the Old Showground concrete car park. Still though, at Scunthorpe Keegan would take his training very seriously. Twice a week, after training, Keegan would train with a teammate named Derek Hemstead and they would train by doing weighted farmers walks up and down the cantilever stand at the Old Showground. Scunthorpe, a club with little money, did not a have a full time driver to drive them to away games and Keegan, with other the other younger players, such as Nigel Jackson, would take turns in driving the minibus to and from away games. Young Keegan, fellow driver Nigel Jackson and fellow young professionals Jimmy Coyne, Alan Olbison and Steve Hibbotson, once borrowed coach Jack Brownsword’s stop watch and had timed rallies around the Old Showground with the clubs vintage tractor. On Keegan’s turn the tractor crashed and the tractors axle went through the engine. The crash was very expensive to fix and the five were given a rollicking by manager Ron Ashman. This experience gave Keegan awareness of his responsibility as a representative of Scunthorpe United. Keegan made his debut against Peterborough United at the age of 17, making 29 league starts in his first season. He became a regular in the first team by the 1969–70 season, playing all 46 league games for the club. This season saw the team reach the fifth-round of the FA Cup, beating Football League First Division side Sheffield Wednesday along the way. Keegan then missed only one game in his last season. Earning a pittance, meant Keegan each summer had to find summer jobs; and each summer he would do jobs such as plate-laying at the Appleby Frodingham Steelworks. Keegan played regularly in a creative right midfield role for the Scunthorpe United first team despite his age – he scored 18 goals in 124 games for the club. After his first season he started attracting interest from higher division clubs. In one rare television interview of Keegan at Scunthorpe in 1969–70, Keegan tried to play down the interest, stating: "I'm getting first-team football here. Should think if I went First Division, I'd struggle a bit." Not long after this interview, Keegan, noting other players had moved on to a higher level, began to feel impatient about moving on and Keegan even considered packing the game in and getting a full time job if he did not get a move to a higher level. Higher division clubs such as Preston, Birmingham City, Notts County, Millwall and Arsenal all showed interest but nothing came of it. In 1971, he attracted the attention of Liverpool's head scout Geoff Twentyman, whose opinion was held in high regard by manager Bill Shankly. He was thus transferred to Liverpool for £33,000 in 1971, at the age of 20. On 14 August 1971, Keegan made his Liverpool debut against Nottingham Forest at Anfield, scoring after 12 minutes. 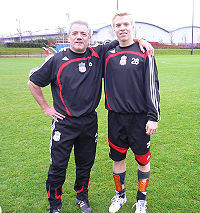 Although originally signed as a midfielder, his ability soon prompted manager Bill Shankly to employ Keegan upfront as a partner for John Toshack. His move to Liverpool also alerted England to his presence, and the forward made his debut at under-23 level later in 1971. His full debut came 12 months after arriving in Liverpool, in a World Cup qualifier against Wales at Ninian Park. Keegan's first goal for his country also came in a game against Wales in Cardiff. This time it was a British Home Championship match that England won 2–0 on 11 May 1974, his third full cap. In 1972–73, Keegan won his first major honours. Don Revie's Leeds United visited Anfield on Easter Monday for a showdown involving two of the three League challengers. The game turned on a few minutes either side of half time. First Leeds' Peter Lorimer contrived to miss an open goal. Two minutes after the break Peter Cormack took his chance to put Liverpool ahead. Keegan added a late second to seal the win. With Arsenal dropping a point at Southampton, Liverpool duly closed out the title with a final game 0–0 draw against Leicester City. This was their first major trophy since seven years before in 1966. They also won the UEFA Cup. The 1973 UEFA Cup Final first leg at Anfield was abandoned due to a downpour after 27 minutes and rescheduled to be played again the next day. The 27 minutes that had been played had given Liverpool manager Bill Shankly an insight into Borussia Mönchengladbach defensive vulnerability in the air. To exploit this he brought tall forward Toshack into the starting team demoting the small build of Brian Hall to appearing only as a late substitute. Keegan profited with two goals set up by Toshack headers in a 3–0 win. Liverpool lost 2–0 away to win 3–2 on aggregate. The following season, Keegan was again a frequent scorer but Liverpool lost the League title to a Leeds United team who had gone unbeaten for a then-record 29 games at the start of the season. Liverpool, however, progressed to the FA Cup final. Their campaign in the competition had started with a tie against the club which had rejected Keegan, Doncaster Rovers, and it was Keegan who scored both Liverpool goals in a 2–2 draw. Liverpool won the replay and Keegan scored twice more on the way to Wembley Stadium, including a lob-volley over the head of England colleague Peter Shilton in the semi-final against Leicester City at Villa Park. In the final, Keegan scored two as Liverpool beat Newcastle United 3–0. It was the first brace in an FA Cup final since Mike Trebilcock scored twice for Everton in 1966. Keegan's next visit to Wembley was three months later in the Charity Shield game, the traditional curtain-raiser to a new season between the League champions and the FA Cup winners. Keegan was sent off, however, along with Leeds captain Billy Bremner, after a scuffle on the pitch. Both players removed their shirts in protest, with Keegan visibly shaken by the decision. The fight was shown that night on BBC television and both were fined £500, with Keegan being suspended for three games and Bremner eight. The next year saw Keegan scoring goals and representing his club and country, but 1974–75 was a trophyless season for Liverpool and England failed to qualify for the European Championships. There were numerous honours for Keegan over the next two years, however, as Liverpool again won the League championship and UEFA Cup in 1975–76. Keegan scored in both legs of the UEFA Cup final against FC Bruges, although he had only scored once previously during Liverpool's run in the competition. In 1976–77, Keegan helped Liverpool progress nearly to an unprecedented "treble" of League championship, FA Cup and European Cup, although midway through the season he announced his intention to leave in the summer to play abroad. Nevertheless, Keegan was irrepressible as Liverpool clinched the title and reached the finals of both Cup competitions. Keegan's last appearance in a Liverpool shirt on home soil, however, saw Liverpool lose the FA Cup final to bitter rivals Manchester United, ending the possibility of the treble. The European Cup final in Rome against Borussia Mönchengladbach was four days later. Keegan did not score, but he did make a late run which led to a foul inside the penalty area by Berti Vogts. This led to a penalty which was successfully converted by Phil Neal, sealing a 3–1 win. After 323 appearances and exactly 100 goals, Keegan left Liverpool as promised. He had been made offers from clubs across Europe, and chose to join Hamburger SV in the West German Bundesliga for £500,000. Liverpool replaced him with Kenny Dalglish. Of his time in Liverpool, Keegan later said, "The only thing I fear is missing an open goal in front of the Kop. I would die if that were to happen. When they start singing 'You'll Never Walk Alone' my eyes start to water. There have been times when I've actually been crying while I've been playing." Keegan's transfer to Hamburg was agreed between the FA Cup final and the European Cup final of 1977, although Keegan had negotiated a maximum transfer fee the season before. On his arrival in Germany, Keegan was the highest paid player in the country, and was built up by the press and club as the "saviour" of Hamburg. He scored in pre-season friendlies against Barcelona and former club Liverpool, but the club suffered defeat in the European Super Cup against the Merseysiders, and Keegan was sent off in a mid-season friendly against VfB Lübeck after knocking out an opposition player with a punch. An unhappy first few months at the club gave way to a more successful season. Although the club finished tenth in the league in 1977–78, Keegan's 12 goals helped him pick up a personal honour, the France Football European Footballer of the Year award for 1978. Hamburg's European campaign of 1979–80 saw Keegan score two goals to help Hamburg past Dinamo Tbilisi, Soviet champions who had beaten Liverpool to reach the latter stages. The club lost to Nottingham Forest in the final in Madrid, however, and this was coupled domestically with being beaten to the Bundesliga title by Bayern Munich. Having negotiated a maximum transfer fee of £500,000 in his contract the year before and agreeing a move in February, Keegan left Hamburg for Southampton in the summer of 1980. On 10 February 1980, Lawrie McMenemy called a press conference at the Potters Heron hotel, Ampfield to announce that the European Footballer of the Year would be joining Southampton in the forthcoming summer. The news caused surprise throughout the world of football and around the city of Southampton, as Southampton were a relatively small club. The club were beginning to become established in the top division, but this signing showed how persuasive their manager could be, especially when Keegan captained England in the 1980 European Championships in Italy. Keegan had a clause inserted into his contract when he joined Hamburg in 1977, giving Liverpool the option to buy him back. Liverpool, however, opted not to exercise this clause when he returned to England three years later. As late as November 2011, Keegan has stated, "I was with Lawrie [McMenemy] at a charity event the other day, and he said he phoned up Peter Robinson because he wanted me, but Liverpool had a clause. Peter said, 'No, we won’t be signing him, definitely, we don't need him.'" It was therefore Southampton boss Lawrie McMenemy who snapped him up for £420,000, and Keegan made his Southampton debut at Lansdowne Road in a pre-season friendly against Shamrock Rovers on 23 July 1980. In the following season, Keegan was able to produce some of his best form and at the end of January 1982 Southampton sat at the top of the First Division table, but a run of only three wins from the end of February meant a seventh-place finish. Despite this, Keegan was voted the PFA Player of the Year and awarded the OBE for services to Association Football. Keegan had scored 26 of the team's 72 goals and was voted the club's Player of the Year. Keegan joined Newcastle United and spent two seasons there, during which time he was extremely popular with the supporters. He played 78 times, scored 48 goals and helped them to promotion from the Second Division in 1984, within a team which also contained Peter Beardsley, Chris Waddle and Terry McDermott. His contribution to Newcastle's promotion, which ended their six-year absence from the First Division, earned him hero status on Tyneside. The move of a player of his stature to a Second Division Club was unheard of, which caused euphoria on Tyneside. Keegan announced his retirement prior to the end of the 1983–84 season, with his last league game against Brighton & Hove Albion scoring in a 3–1 victory. His final appearance for Newcastle came in a friendly against Liverpool some days later, leaving the pitch in a helicopter while still dressed in his kit. Keegan made his England debut on 15 November 1972 in a 1–0 World Cup qualifying win over Wales. Keegan appeared in only the two matches against Wales during this campaign as England failed to qualify for the 1974 FIFA World Cup. He scored his first international goal in his third appearance, also against Wales, on 11 May 1974. He was given the captaincy by manager Don Revie in 1976 after Gerry Francis fell from favour. He went on to captain England 31 times, retaining the captain's armband until his international retirement after the 1982 World Cup. Keegan captained England at the 1980 Euros. England failed to progress from the group stage after finishing third in their group behind Italy and Belgium. He managed only one World Cup appearance though, after England failed to qualify for both the 1974 and 1978 tournaments. He finally reached a World Cup in 1982 when England got to the finals in Spain. He was named in the squad for the tournament, but was suffering from a chronic back injury and was unfit to play in all of England's group games. In a last, desperate effort to play in a World Cup (he knew that he would not be around for the 1986 competition) he secretly hired a car and drove from Spain to a specialist he knew in Germany for intensive treatment. He recovered sufficiently to appear as a substitute for the last 26 minutes of England's final second round game against hosts Spain. During this time he missed a point-blank header which would have broken the deadlock, in a game England needed to win to progress to the semi-finals. England drew the game 0-0 and were eliminated from the competition. Following the successful start to the 1982–83 season with Newcastle United, there was much controversy when newly appointed England manager Bobby Robson did not select Keegan for his first squad, a decision Keegan learned of from the media rather than Robson himself. Keegan publicly expressed his displeasure at not being given the courtesy of a phonecall from Robson, and never played for his country again. He had won a total of 63 caps and scored 21 goals. On 5 February 1992, almost eight years after his final game as a player, Keegan returned to football as manager of Newcastle United. They had been relegated from the top flight in 1989 and narrowly missed out on promotion in 1990 after losing in the playoffs to arch-rivals Sunderland, but in 1991 they had failed to make the playoffs and at several stages in 1991–92 they had occupied bottom place in the Second Division. Following the dismissal of previous manager Ossie Ardiles, Keegan was appointed to prevent Newcastle from being relegated to the third tier of English football for the first time. Survival was achieved and Newcastle would be playing in the new Division One for the 1992–93 season, with chairman John Hall promising millions of pounds to spend on new players after Keegan almost walked out on the club after a match at home to Swindon Town on 14 March 1992. Keegan strengthened the defence with the acquisition of Barry Venison from Liverpool and John Beresford from Portsmouth, while striker David Kelly had arrived on Tyneside a few months before Keegan was appointed. Newcastle began the season with 11 successive wins and led the league virtually all season, and the club record signing of Bristol City striker Andy Cole in February further strengthened their side; Cole netted 12 goals in his first 12 games for the club. The addition of Charlton Athletic's Rob Lee bolstered the midfield in the autumn. Keegan then strengthened his side by signing Swiss World Cup defender Marc Hottiger and Belgium's defensive midfielder Philippe Albert, while Norwich City's quick winger Ruel Fox had arrived on transfer deadline day in March 1994. Newcastle won their first six games of the 1994–95 season to top the league and they appeared capable of winning their first league title since 1927. But the shock departure of Andy Cole to Manchester United in January weakened their attack, and finished the season sixth place in the final table; not enough for even another UEFA Cup campaign. In the meantime, autumn signing Paul Kitson partnered Beardsley in attack. Keegan made several important additions to the Newcastle side in the summer of 1995: Reading goalkeeper Shaka Hislop, Paris Saint-Germain's French winger David Ginola, Queens Park Rangers striker Les Ferdinand and Wimbledon defender Warren Barton. Ferdinand was Newcastle's biggest signing at £6 million, while the £4 million paid for Barton was the highest fee paid for a defender in English football at the time. Newcastle excelled in the first half of the 1995–96 season, going ten points ahead on 23 December 1995 and holding a 12-point lead from early in January to 4 February. After a 2–0 defeat at West Ham United on 21 February, the lead was cut to nine points. A 1–0 defeat at the hands of fellow title challengers Manchester United cut the gap to a single point on 4 March, and within two weeks Newcastle's lead was overhauled and they were unable to recover it. Newcastle's 4–3 defeat to Liverpool on 3 April is widely considered to be one of the classic Premier League games. With two games remaining Newcastle and Manchester United both had 76 points. Newcastle only got one point in a 1–1 drawn match against Nottingham Forest on 2 May, and with a 1–1 draw for Newcastle against Tottenham Hotspur on the final day of the season on 5 May, the title was won by United, whose 3–0 triumph at Middlesbrough would have won them the title regardless of Newcastle's result against Tottenham. Keegan stated in 2018 that if Newcastle United had won the title in that season, the squad, which included players such as Les Ferdinand, Darren Peacock, David Ginola, Peter Beardsley, Faustino Asprilla and Rob Lee would have stayed together, may have built up a momentum, and won more trophies. During the race for the 1995–96 title, Keegan directed remarks at the Manchester United manager, Sir Alex Ferguson, during a post-match interview live on Sky Sports. His outburst — "I would love it if we beat them! Love it!" — is frequently referred to when describing the relationship between the pair. In April 2003, it was named as Quote of the Decade in the Premier League 10 Seasons Awards and Most Memorable Quote in the 20 Seasons Awards in May 2012. It also appeared in Channel 4's 100 Greatest Sporting Moments. Keegan then broke the world transfer fee record by signing Blackburn Rovers and England striker Alan Shearer in July 1996. Shearer, who had been the Premier League's top scorer in the last two seasons, was born in Newcastle and had grown up as a fan of the club. Shearer made an instant impact on his native Tyneside, despite being on the losing side on his debut, a 4–0 FA Charity Shield defeat at the hands of Manchester United, and scored two months later in a 5–0 victory against United in the Premier League. Newcastle briefly topped the league at several stages in the first half of the season and Shearer led the league scoring 25 goals. Newcastle United Football Club today announce the resignation of manager Kevin Keegan. Kevin informed the board of his wish to resign at the end of the season, having decided he no longer wishes to continue in football management at this stage in his life. Following lengthy discussions of which the board attempted to persuade Kevin to change his mind, both parties eventually agreed that the best route forward was for the club to, reluctantly, accept his resignation with immediate effect. On the Newcastle United DVD Magpie Magic, it is said that chairman Sir John Hall asked for a long term commitment as manager from him which he was unwilling to give, while it also states that many still rumour that the pressure and criticism of selling Andy Cole and the failed title challenge in 1995–96 took its toll on him. He was succeeded by Kenny Dalglish, the same man who had replaced him as a player at Liverpool 20 years earlier, but Newcastle were unable to win the title and finished second place in the same season, and in the following season finished outside the top ten in the Premier League, although they were FA Cup runners-up. They did not return to the top five of the Premier League until the 2001-02 season, when they finished fourth under Bobby Robson. 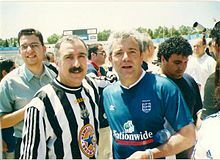 It was during this period that Keegan gained the nickname "King Kev" from Newcastle fans. Keegan returned to football on 25 September 1997 as "chief operating officer" (a similar role to a director of football) at Division Two club Fulham, with Ray Wilkins as head coach. Fulham finished sixth in the final table, but Wilkins was sacked just before the first leg of the playoff semi-final and Keegan took over as manager. His appointment came a few months after the takeover of the club by Harrods owner Mohamed Al-Fayed, who gave Keegan £10 million to spend on players that season as the first part of a £40 million attempt to deliver Premier League football to the Craven Cottage club, who had been outside the top flight since 1968 and had not even played in the league's second tier since 1986. Keegan was unable to inspire Fulham to overcome Grimsby Town in the playoffs, but good form in 1998–99 – helped by the acquisition of more players who would normally have been signed by Premier League or Division one clubs – clinched them the Division Two title and promotion to Division One, but Keegan left at the end of the season to concentrate on his duties as England manager, having succeeded Glenn Hoddle in February 1999. Fulham replaced Keegan with Paul Bracewell and reached the Premier League two years later under Bracewell's successor Jean Tigana, with a squad still featuring many of the players bought by Keegan or Wilkins. After weeks of speculation, Keegan was named as the new England manager on 18 February 1999, succeeding Glenn Hoddle, who had been sacked two weeks earlier following a newspaper interview in which he suggested that disabled people were being punished for their sins in a previous life. He led the team to a winning start with 3–1 victory over Poland to reignite England's Euro 2000 qualifying campaign, and they entered the qualification playoff with Scotland. Two goals from Paul Scholes gave them a 2–0 win in the first leg, and despite a 1–0 defeat in the second leg, they qualified for the championships for the fourth tournament in succession (though on the third occasion, they had qualified automatically as hosts). After an initial popular period as manager, he began to come under fire for his perceived tactical naivety. This came to a head during the unsuccessful Euro 2000 campaign, which began with a 3–2 defeat against Portugal, despite England having taken a 2–0 lead after 17 minutes. A 1–0 win in the next game over Germany, the first English victory over Germany in a competitive match since 1966, cost their opposition (the defending champions) progression to the quarter-finals, but in the final group game against Romania, England once again lost 3–2, this time after taking a 2–1 lead, and their hopes of reaching the quarter-finals were over. Keegan resigned as England manager on 7 October 2000, after England lost to a Dietmar Hamann goal for Germany in their first 2002 World Cup qualifier, in the last game to be played at Wembley Stadium, before the old stadium was rebuilt. Keegan won only 38.9% of his games in charge, the lowest such percentage of any permanent England manager – although unlike Don Revie (1974–1977) or Steve McClaren (2006–2007), Keegan achieved qualification to a major tournament for England. When Sven-Göran Eriksson became England manager, Eriksson appointed the 64-year-old Tord Grip as his assistant. This caused Keegan to complain that when he was England manager, the FA had told him that he could not have Arthur Cox as his assistant because at 60, Cox was too old. Keegan went on, "I wasn't allowed to bring in the people I wanted and that was wrong. Mr Eriksson was and I'm delighted for him because that's the way it should be." On 24 May 2001, Keegan returned to football as successor to Joe Royle at Manchester City, who had just been relegated from the Premier League. Keegan signed experienced international players such as Stuart Pearce, Eyal Berkovic and Ali Benarbia. That season, City were promoted as Division One champions after scoring 108 league goals. Keegan was the first manager in the Premier League era to win the Division One title with two clubs. In preparation for his second season as manager (2002–03), he signed Nicolas Anelka, Peter Schmeichel and Marc-Vivien Foé. That season saw Manchester City win against Liverpool at Anfield and take four points from Manchester United (their previous win in the Manchester derby being in September 1989), but concede five goals away to Chelsea and at home to Arsenal, securing their Premier League status comfortably by finishing ninth. Keegan also guided City into the UEFA Cup, qualifying via the UEFA Fair Play ranking. For 2003–04, the club's first season at the new City of Manchester Stadium, Keegan added Steve McManaman, Paul Bosvelt, David Seaman and Michael Tarnat to City's squad. City started well and were fifth in the league on 5 November. However, a draw at home to Polish minnows Groclin led to their second round elimination from the UEFA Cup, and was followed by a slump in form. City did not win again in the league until 21 February, and finished 16th in the league, although at Tottenham Hotspur in the FA Cup on 4 February 2004, despite going in at half time 3–0 behind and with ten men after Joey Barton was sent off; Keegan's team came back to win 4–3. 2004–05 brought better form for Manchester City, but Keegan agreed to leave as manager on 10 March 2005 after telling the chairman his desire to retire from football at the end of the season. The club went on to finish eighth under his successor Stuart Pearce, and only missed out on a UEFA Cup place when Robbie Fowler missed a penalty in stoppage time of a 1–1 draw with Middlesbrough on the last day of the season, with the last European place going to their opponents instead. Earlier that season, while still under Keegan's management, City beat Chelsea 1–0 which turned out to be the only defeat in the league that season for Chelsea, who ended up as Premier League champions. After declaring his retirement from football in 2005, Keegan remained out of the media spotlight, working at the Soccer Circus football school in Glasgow. In October 2007, he indicated he was unlikely to manage again. Following the dismissal of manager Sam Allardyce, Keegan made a sensational, unexpected return to Newcastle United on 16 January 2008. Thousands of Newcastle United fans attended St James' Park to welcome the manager back to the club as he arrived to see the FA Cup third round replay against Stoke City alongside owner Mike Ashley and chairman Chris Mort. He managed his first game at the club since 1997 against Bolton Wanderers on 19 January 2008. He awarded the club captaincy to Michael Owen, stating, "He's not scared to give his opinion when he's right, and he's not scared to say what he feels. He's a tremendous professional, and he trains properly every day." Keegan announced on 22 January that he and Alan Shearer held talks about the two linking up with Shearer as his assistant, but decided against the idea, leaving the door open for him to take other roles he was interested in. Keegan's first eight games back at Newcastle passed without a win. On 22 March 2008, however, Keegan achieved the first victory of his second managerial spell, a 2–0 win against his former club Fulham. This was his first win as Newcastle manager since beating Leeds United on 1 January 1997, and he followed it up with wins over Tottenham and Sunderland, maintaining his perfect record over the club's local rivals in the Tyne-Wear derby and also putting Newcastle on top of the league's form chart. This run of good form was hugely thanks to a new 4–3–3 formation which was spearheaded by the productive strike trio of Obafemi Martins, Michael Owen and Mark Viduka. The trio scored 11 of the club's 14 goals in this run, which safely secured the club from a relegation battle. Newcastle's seven-game unbeaten run came to an end in a home defeat to Chelsea, and they finished the season in 12th place. Having signed Argentine international winger Jonás Gutiérrez, as well as Gutiérrez's Argentina teammate and defender Fabricio Coloccini from Deportivo de La Coruña, amongst others, Newcastle began the 2008–09 season with a 1–1 draw against Manchester United at Old Trafford, having lost the previous season's fixtures 6–0 and 5–1, as well as beating Bolton 1–0 the following week and Coventry City 3–2 in the second round of the League Cup on 26 August. As the 2007–08 season drew to a close, rumours of tensions between the club's directors and Keegan began to surface, as he publicly criticised the board, claiming they were not providing him the financial support necessary to break into the top four of the Premier League standings. His accusations further fanned the flames for owner Mike Ashley, who was already battling reports that he had lost hundreds of millions of pounds in a disastrous stock market venture. Following the closure of the transfer window at midnight on 1 September 2008, early on in the morning the following day, various media sources reported that Keegan had either resigned from the club or had been sacked, leading to fan protests around St James' Park. The club released statements denying that he had left the club, but stated that talks were ongoing between Keegan and members of the board. On 4 September 2008, Keegan issued a statement confirming that he had resigned the same day, stating that, "... a manager must have the right to manage and that clubs should not impose upon any manager any player that he does not want." Late on Friday 12 September 2008, it was reported Keegan met owner Mike Ashley in London in an attempt to resolve their differences, but the meeting ended without a satisfactory conclusion for either party. Richard Bevan, chief executive of the League Managers Association (LMA), stated the following month that Keegan would consider a return to the club but only if those who hold the ownership are willing to develop a structure which he is happy with. Up until Dennis Wise's resignation as director of football at Newcastle in April 2009, many fans directed the blame of Keegan's exit at both owner Mike Ashley and Dennis Wise as a result of such a role being established and poorly used. The club was warned by the LMA on 5 September 2008 to develop a structure which would satisfy the next manager to replace Keegan to avoid a similar situation repeating itself and damaging the club's image. In December 2008, it was reported that following Ashley's decision to withdraw the sale of Newcastle United, a legal dispute in regards to Keegan's departure of the club was in place between himself and Ashley, with Keegan claiming unfair dismissal and Ashley claiming damage to his public image. In September 2009, it was reported that Keegan had met with Ashley and the Newcastle board – including former members – in a Premier League arbitration hearing for a claim of £10 million in compensation for his shock resignation. Keegan's dispute with the club was resolved in October 2009. The tribunal ruled in favour of Keegan, agreeing that Newcastle had constructively dismissed him by insisting on the signing of midfielder Nacho González on loan (which was against his wishes) to replace James Milner following his move to Aston Villa and a bid for Bayern Munich's Bastian Schweinsteiger being rejected. The ruling was based around seven issues. The panel declared that Keegan had been misled to believe he had the final decision on player transfers, and was never explicitly told in writing, his contract, or word of mouth that he did not or that his role would see him essentially report to others. Given the generally understood role of a Premiership manager, the panel agreed he could reasonably expect that this was not a factor. The club's signing of González meant that they had violated his employment contract, which amounted to constructive dismissal. While González was the main issue in the panel final decision, the club's alleged mistreatment of Keegan, claiming they were in a position to sack him should he have not agreed to the terms they offered him, as well as his decision to remain at the club until the 4 September instead of resigning on 1 September, allowing the club to reach a compromise, led to the panel ruling in Keegan's favour. Keegan was awarded £2 million (plus interest accrued) according to severance clauses in his contract, which the club never paid him after his departure. Claims for more were turned down on the basis that the standard contract severance clauses covered constructive dismissal, but he stated afterwards that the purpose of his claim had been to restore his reputation, and was delighted with the outcome, allowing him to move forward. In pursuit of winning the tribunal, the club admitted to misleading the media and their fans. Several key senior staff, including Dennis Wise and Derek Llambias, had publicly claimed that Keegan had "the final word"; they claimed to the tribunal that this was not in fact the case and that their claims were just "PR". It was then revealed that Director of Football Dennis Wise asked Keegan to sign González by watching him "on YouTube". On 21 October, a subsequent meeting of the same panel found that the club should pay all legal and associated costs incurred by Keegan as a result of the tribunal. They reached this conclusion based on their view that the club's "defence on the primary liability issue was, in our view, wholly without merit". Keegan stated after the hearing he still wants to manage in the top flight of football, and would consider returning to his position at the club, but feels the fans may be exhausted from his last tenure and would prefer him not to. In June 2013, Keegan stated he would only consider a return should owner Mike Ashley leave the club. Keegan has continued to criticise Ashley, accusing him of a lack of respect for the fans. In August 2009, nearly a year after his departure from Newcastle, Keegan resurfaced after being confirmed as the lead pundit on ESPN. During the course of the 2010 World Cup, Keegan featured as a pundit for ITV broadcasts. He was part of ESPN's live coverage of the 2011, 2012 and 2013 FA Cup finals with pitch-side build-up and post-match commentary. Keegan has been married to Jean Woodhouse since 23 September 1974, having met her in 1968, and has two daughters, Laura and Sarah. In 1976, Keegan competed in the BBC's television programme Superstars. Despite suffering severe cuts after crashing his bicycle, he insisted on re-racing and secured second place in the event, before going on to win that edition of the programme. He also advertised Brut aftershave alongside boxer Henry Cooper. Keegan became renowned for his "poodle perm" hair in the 1970s, and has regularly appeared at the top of "worst hairstyles" surveys. Keegan released a single in 1972 titled "It Ain't Easy". In 1979, his song "Head Over Heels in Love", written by Chris Norman and Pete Spencer, was released on 9 June, and peaked at number 31 in the UK charts, but climbed to number 10 in Germany where Keegan was based at the time, and where Norman's band Smokie were popular. He released another single, "England", on his return to England from Germany, but it failed to chart. In April 1991, he was attacked while sleeping in his Range Rover by the M25 at Reigate Hill in Surrey. His assailants later said in court that they needed money for a drugs debt and had no idea they were attacking Keegan. In February 2009, Keegan had three points added to his driving licence after being caught doing 36 mph in a 30 mph zone on the A69 road in August 2008. This brought his total to 12 points and he consequently received a six-month driving ban. He narrated the 90-minute documentary Keegan on Keegan, released via Castle Vision on VHS cassette in 1992. He is known for his charity appearances for the Lord's Taverners. In early July 2008, Flybe International announced the naming of one of their new Bombardier Q400 aircraft in honour of Keegan's service to Newcastle United, both as a player and as manager. The plane is used on the regular service from Newcastle International Airport to London's Gatwick Airport. As of match played 30 November 2013. ^ a b Chalk, Gary; Holley, Duncan; Bull, David (2013). All the Saints: A Complete Players' Who's Who of Southampton FC. Southampton: Hagiology Publishing. p. 367. ISBN 978-0-9926-8640-6. ^ a b "Kevin Keegan factfile". BBC. 7 October 2000. Retrieved 14 July 2006. ^ Lawton, Matt (27 September 2010). "Rooney's to blame: Manchester United star Wayne is shot to pieces and it's all his fault, blasts Kevin Keegan". The Daily Mail. London. ^ a b "Keegan resigns as Newcastle boss". BBC. 4 September 2008. Retrieved 4 September 2008. ^ Keegan (2018), Location 380-381. ^ Keegan (2018), Location 362-380. ^ Keegan (2018), Location 311-317. ^ Keegan (2018), Kindle location 312. ^ Keegan (2018), (Kindle Locations 325-326). ^ Keegan (2018), Location 381-382. ^ a b Keegan (2018), (Kindle Locations 385-386). ^ Keegan (2018), Kindle location 315. ^ Keegan (2018), Kindle location 460. ^ Keegan (2018), Kindle locations 492-513. ^ Keegan (2018), Kindle location 486. ^ Keegan (2018), Kindle locations 508-509. ^ Keegan (2018), Kindle location 1345. ^ Keegan (2018), Kindle locations 636-650. ^ Keegan (2018), Kindle location 511. ^ Keegan (2018), Kindle location 512. ^ Keegan (2018), Kindle location 518. ^ Keegan (2018), Kindle location 521. ^ Keegan (2018), Kindle locations 530-543. ^ a b c d e f Keegan (1998), pp. 53-82. ^ Keegan (2018), Kindle location 582. ^ Keegan (2018), Kindle location 586. ^ Keegan (2018), Kindle location 657. ^ Keegan (2018), Kindle location 578. ^ a b c d Keegan (2018), Kindle location 609. ^ Keegan (2018), Kindle location 660. ^ a b Keegan (2018), Kindle location 661. ^ Keegan (2018), Kindle location 600. ^ Keegan (2018), Kindle location 665. ^ Keegan (2018), Kindle locations 667-672. ^ Keegan (2018), Kindle location 677. ^ Tony Barret (7 August 2009). "Liverpool FC super-scout Geoff Twentyman's secret diary revealed". Liverpool Echo. Retrieved 29 April 2011. Simon Hughes (6 August 2009). Secret Diary of a Liverpool Scout. Trinity Mirror Sport Media. ^ Keegan (2018), Kindle location 701. ^ "Kevin Keegan Biography". soccer-fans-info.com. Archived from the original on 16 September 2008. Retrieved 28 July 2008. ^ Keegan (1998), pp. 83-118. ^ "Past Player Profile: Kevin Keegan". Liverpool F.C. Retrieved 10 August 2014. ^ "Legends: Kevin Keegan". The Football Association. Retrieved 10 August 2014. ^ ""Eighth league title secured" Liverpoolfc.com". Archived from the original on 25 October 2017. Retrieved 20 December 2018. ^ "Reds reach European goal". uefa.com. Archived from the original on 20 August 2014. Retrieved 10 August 2014. ^ Keegan, Kevin (9 March 2011). "Liverpool v Newcastle". shortlist.com. Archived from the original on 11 March 2011. Retrieved 9 March 2011. ^ "Liverpool FC Quotes". Liverpool FC. Archived from the original on 7 January 2007. Retrieved 10 January 2007. ^ Keegan (1998), pp. 119-146. ^ a b c Keegan (1998), pp. 147-172. ^ a b c "Ballon d'or" (in French). France Football. Archived from the original on 12 August 2014. Retrieved 10 August 2014. ^ Jeffries, Stuart (25 June 2011). "The Saturday interview: Kevin Keegan". Guardian. Retrieved 10 August 2014. ^ Keegan (1998), pp. 173-191. ^ Duncan Holley & Gary Chalk. In That Number – A post-war chronicle of Southampton FC. p. 167. ^ Jeremy Wilson (2006). Southampton's Cult Heroes. Know The Score Books. pp. 150–151. ISBN 1-905449-01-1. ^ "Kevin Keegan – Archive". MirrorFootball.co.uk. Archived from the original on 30 May 2013. Retrieved 27 August 2011. ^ "Kevin Keegan". englandstats.com. Retrieved 30 July 2008. ^ "Match of the 80s – Season 82–83 (Part 1 of 4)". YouTube. 13 July 2007. Retrieved 27 August 2011. ^ Turnbull, Simon (15 August 1996). "Welcome to the North-east... Football's land of plenty". The Independent. Retrieved 15 March 2017. ^ "Ten of the greatest: Premier League games". ^ McCormick, Sean (2 April 2018). "'We could have won a couple more titles' - Kevin Keegan discusses Newcastle's Entertainers". Chronicle. Newcastle-upon-Tyne. Retrieved 2 April 2018. ^ John Aizlewood (7 November 2004). "The top 10 sporting mismatches". The Times. London. Retrieved 3 December 2008. ^ "100 Greatest Sporting Moments". Channel 4. Retrieved 10 August 2014. ^ Randall, Colin (30 July 1996). "Shearer is going home for £15m". Daily Telegraph. London. Archived from the original on 12 March 2005. Retrieved 21 July 2008. ^ "Season 1996/97". Premier League. Archived from the original on 12 August 2014. Retrieved 10 August 2014. ^ "KEV'S pounds 40m SPREE; Fulham to buy place at the top". thefreelibrary.com. The Mirror. 25 September 1997. Retrieved 19 July 2012. ^ Tongue, Steve (9 May 1999). "Keegan leaves with flea in his ear". The Independent (London). Retrieved 10 August 2014. ^ Adam, Szreter (30 April 1999). "Bracewell in the Fulham frame". The Independent (London). Retrieved 10 August 2014. ^ "Keegan poised for England job". BBC News. 16 February 1999. Retrieved 25 January 2009. ^ "Keegan in charge – for now". BBC Sport. British Broadcasting Corporation. 17 February 1999. Retrieved 10 February 2012. ^ "Scholes gives Keegan winning start". BBC Sport. British Broadcasting Corporation. 28 March 1999. Retrieved 10 February 2012. ^ "Scholes silences Scots". BBC Sport. British Broadcasting Corporation. 15 November 1999. Retrieved 10 February 2012. ^ "England book Euro 2000 place". BBC Sport. British Broadcasting Corporation. 18 November 1999. Retrieved 10 February 2012. ^ "England crushed in five-goal classic". BBC Sport. British Broadcasting Corporation. 13 June 2000. Retrieved 10 February 2012. ^ "England beat Germany – at last". BBC Sport. British Broadcasting Corporation. 17 June 2000. Retrieved 10 February 2012. ^ "Late penalty breaks English hearts". BBC Sport. British Broadcasting Corporation. 20 June 2000. Retrieved 10 February 2012. ^ "Keegan's reign of error". BBC Sport. British Broadcasting Corporation. 7 October 2000. Retrieved 10 February 2012. ^ Moreton, Cole (8 October 2000). "Keegan quits football as England lose". The Independent. London: Independent Print Limited. Retrieved 10 February 2012. ^ "Wembley's sad farewell". BBC Sport. British Broadcasting Corporation. 7 October 2000. Retrieved 10 February 2012. ^ "Keegan's swipe at FA". BBC Sport. 8 April 2002. Retrieved 25 April 2007. ^ a b c d "Keegan ends his reign at Man City". BBC Sport. 11 March 2005. Retrieved 29 August 2008. ^ "Keegan hails his City slickers". Chronicle Live. 6 November 2003. Retrieved 10 August 2014. ^ "Man City 1-0 Chelsea". BBC. 16 October 2004. Retrieved 27 November 2015. ^ "Big Top won't be the same as ringmaster goes to Toon". Donegan, Lawrence; The Guardian. London. 18 January 2008. Retrieved 18 January 2008. ^ "I will not manage again – Keegan". BBC. 15 October 2007. Retrieved 18 January 2008. ^ "Keegan in shock Newcastle return". BBC Sport. BBC Online. 16 January 2008. Retrieved 16 January 2008. A sign of how highly regarded Keegan is on Tyneside was reflected in a statement on the Newcastle website: 'Geordie messiah to be unveiled as new United manager'. ^ Burton, Chris (17 January 2008). "Keegan sees Magpies cruise". Sky Sports. BSkyB. Archived from the original on 29 April 2008. Retrieved 25 January 2009. A fine Newcastle display saw them cruise to a 4–1 victory against Stoke. Such was the desire to share in a significant night on Tyneside, kick-off had to be delayed by 15 minutes as fans flocked to buy tickets in the wake of the announcement that Keegan was on his way back. ^ Burton, Chris (19 January 2008). "Bolton spoil Keegan's party". Sky Sports. BSkyB. Archived from the original on 7 May 2008. Retrieved 25 January 2009. Kevin Keegan's first game back in charge at Newcastle produced an uninspiring 0–0 draw with Bolton. ^ "Keegan: Owen stays as captain". Sunderland Echo. 23 July 2008. Retrieved 19 August 2008. ^ Parrish, Rob (26 January 2008). "Shearer won't be Toon No.2". Sky Sports. Retrieved 25 January 2009. ^ Chowdhury, Saj (22 March 2008). "Newcastle 2–0 Fulham". BBC. Retrieved 22 April 2008. ^ McKenzie, Andrew (20 April 2008). "Newcastle 2–0 Sunderland". BBC. Retrieved 22 April 2008. ^ "Toon Top Premier Form Chart". nufc.co.uk. 10 August 2014. Retrieved 21 March 2010. ^ "Tables". Newcastle United FC. Archived from the original on 13 August 2014. Retrieved 10 August 2014. ^ "Jonas Gutierrez joins Newcastle". Daily Telegraph. London. 2 July 2008. Retrieved 19 August 2008. ^ "Keegan Captures Coloccini". Sky Sports. 15 August 2008. Retrieved 21 September 2008. ^ "Magpies confirm Bassong deal". Sky Sports. 30 July 2008. Retrieved 21 September 2008. ^ "Fixtures & Results". Newcastle United FC. Archived from the original on 8 February 2016. Retrieved 29 August 2008. ^ "Owen sparks Magpies success". Sky Sports. 23 August 2008. Archived from the original on 12 January 2009. ^ "Owen sees Magpies through". Sky Sports. 26 August 2008. Archived from the original on 11 January 2009. ^ Wood, Zoe (28 October 2009). "Mike Ashley undone by his gamblers' instinct". The Guardian. London. Retrieved 7 April 2010. ^ "Newcastle deny 'Keegan sacked' reports". CNN. 2 September 2008. Retrieved 4 September 2008. ^ "Fans protest as Keegan rumours rise". Financial Times. Retrieved 4 September 2008. ^ "Official NUFC statement". Newcastle United. Archived from the original on 18 October 2015. Retrieved 10 August 2014. ^ "League Manager's Association Official Website". LMA. Archived from the original on 15 September 2008. Retrieved 12 September 2008. ^ "Keegan open to Toon return". Sky Sports. 11 October 2008. Retrieved 25 January 2009. ^ McNulty, Phil (2 September 2008). "Keegan exit turns heat on Ashley". BBC. Retrieved 27 August 2011. ^ "Toon need to sort out structure - LMA". Shields Gazette. 5 September 2008. Retrieved 10 August 2014. ^ Stewart, Rob (6 December 2008). "Kevin Keegan warned over suing Newcastle United owner Mike Ashley". The Daily Telegraph. London. Retrieved 7 May 2010. ^ Bird, Simon (14 September 2009). "Kevin Keegan is right to take on Mike Ashley... and it will be a victory for football should he win the case". Daily Mirror. Retrieved 10 August 2014. ^ Douglas, Mark (29 March 2017). "The incredible story of Newcastle trying to sign Schweinsteiger on the cheap - and Keegan quitting". Evening Chronicle. Retrieved 7 July 2017. ^ "KK v NUFC - the verdict". nufc.com. 2 October 2009. Archived from the original on 28 November 2010. Retrieved 10 August 2014. ^ "Keegan wins £2m Newcastle damages". BBC News. 2 October 2009. Retrieved 7 May 2010. ^ "Magpies must pay Keegan costs". Sky Sports. 21 October 2009. Retrieved 3 March 2012. ^ Bailey, Richard (5 October 2009). "Keegan wants to manage again". Sky Sports. Retrieved 3 March 2012. ^ "Kevin Keegan labels return to Newcastle as 'an absolute living nightmare'". The Independent. London. 6 June 2013. ^ "Kevin Keegan slams Newcastle owner Mike Ashley for showing 'a total lack of respect' to supporters". Daily Mirror. 3 May 2014. Retrieved 16 May 2014. ^ Sweney, Mark (24 August 2009). "ESPN signs Kevin Keegan to front its Premier League coverage". The Guardian. London. Retrieved 7 May 2010. ^ "Matches of the Day: How footballing marriages of yesterday compare to Coleen and Wayne's lavish nuptials". Evening Standard. London. 12 June 2008. Archived from the original on 26 August 2011. Retrieved 3 March 2012. ^ "Superstars: A brief history". BBC Sport. 5 November 2004. Retrieved 5 February 2009. ^ "Keegan's the hair apparent". BBC. 2 October 2000. Retrieved 5 February 2009. ^ Freeman, Hadley (3 December 2002). "Footballers top poll for worst hairstyles\". The Guardian. London. Retrieved 5 February 2009. ^ "Kevin Keegan Head Over Heels in Love lyrics". Bob Dunning. Archived from the original on 15 August 2013. Retrieved 21 September 2008. ^ Jackson, Jamie (27 May 2007). "King Kev's circus act". The Guardian. London. Retrieved 5 February 2009. ^ "Speeding Keegan given driving ban". BBC News. 5 February 2009. Retrieved 5 February 2009. ^ "Flybe passengers set to fly in Kevin Keegan". Travel Counsellors. Archived from the original on 30 September 2008. Retrieved 10 August 2014. ^ "Kevin Keegan". Liverpool FC. Retrieved 16 June 2018. ^ "Kevin Keegan: Player profile". Eurosport. Retrieved 16 June 2018. ^ "Bundesliga Historie 1978/79" (in German). kicker. ^ "Football Hall of Fame – Kevin Keegan". National Football Museum. Archived from the original on 25 April 2014. Retrieved 10 August 2014. ^ "100 PWSTK – The Definitive List". Liverpool FC. Archived from the original on 31 July 2008. Retrieved 29 August 2008. ^ "Manager profile: Kevin Keegan". Premier League. Retrieved 14 September 2018. ^ a b "Kevin Keegan". National Football Teams. Benjamin Strack-Zimmerman. Retrieved 27 August 2011. ^ a b c Arnhold, Matthias. "Joseph Kevin Keegan – International Appearances". Rec.Sport.Soccer Statistics Foundation. Rec.Sport.Soccer Statistics Foundation. Retrieved 10 February 2012. Keegan, Kevin (1998). My Autobiography. London: Warner Books. ISBN 978-0-7515-2377-5. Keegan, Kevin (4 October 2018). Keegan, Kevin. My Life in Football: The Autobiography. United Kingdom: Pan Macmillan. ISBN 978-1509877201. Wikimedia Commons has media related to Kevin Keegan.